If you haven't tried cross-stitch before, you may be surprised to discover that it's easier than you think. I fell in love with the adorableness of Stitch People, and pretty soon found myself stitching up entire family portraits (for my and my husband's side of the family) for Mother's Day. The process was fun, relatively quick, and totally painless (except for a few needle pokes here and there). Since making the initial family portraits, I've made a few as gifts for friends and some other non-portrait cross-stitched pieces for other projects. 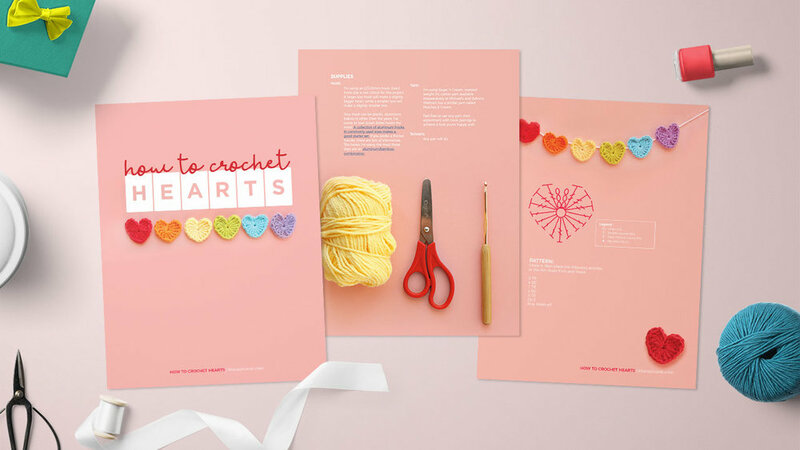 If you're new to the art form, Lizzy makes it easy with super simple starter kits and tons of patterns and inspiration, some of which are entirely free. 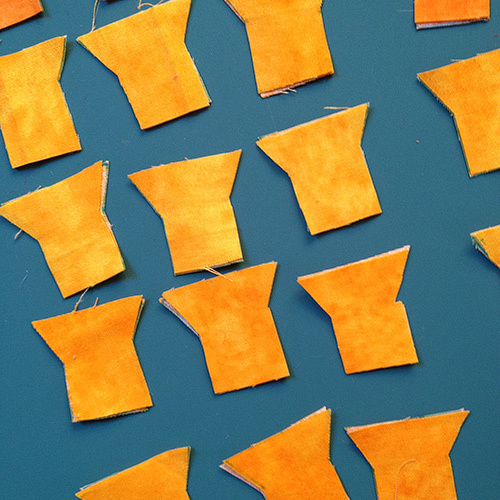 All you need to get started is some Aida fabric, a hoop, some floss, a needle, and some scissors. Then just like that—you're a cross-stitcher! I've been busy putting my winter break to good use. 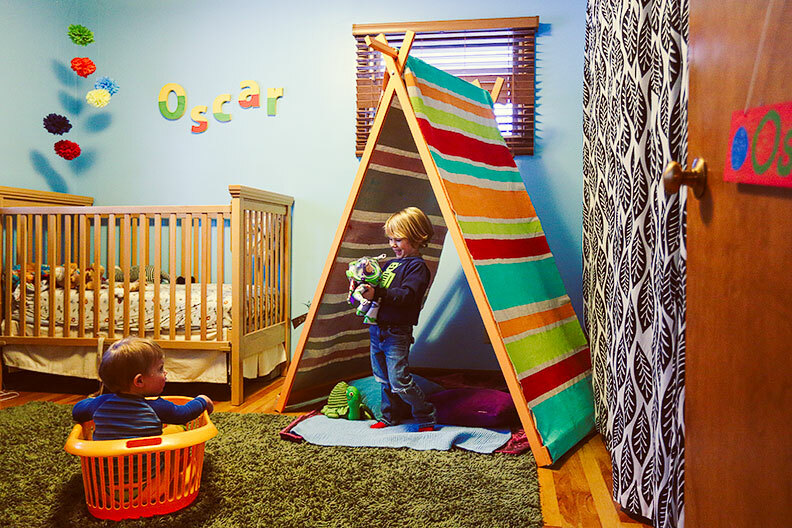 Brushing up on my sewing skills, I had a ball putting together this darling gift idea for the kids in my life. I was originally inspired by this paper and string version, but wanted something a little more hearty that would last longer with regular use. I also felt like "hooks" may be too sharp and too tricky for the little ones to manipulate, so I opted to go with magnets instead. I cranked out four of these sets in a couple of days, so making a single set should be a piece of cake! Several friends have asked for a tutorial, so without further ado, here it is! Pattern. Download a printable PDF I made of the fish and fish mouth shapes. Be sure to print at 100% (don't scale). Fabric. I used several packs of fat quarters for variety. 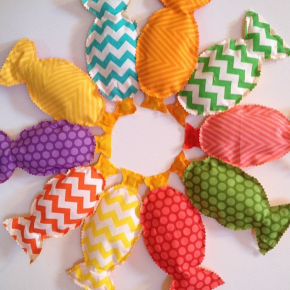 Each fat quarter makes 8 fronts and backs (that's four (4) fish), so get as many fat quarters as you want variety. 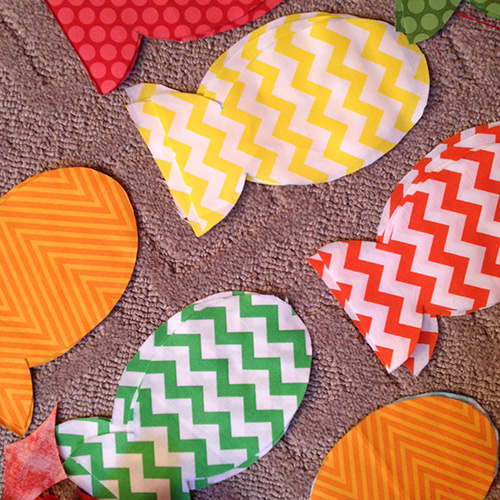 Because I made ten (10) fish for each gift set, I used 10 different fat quarters because I wanted each one to be different. 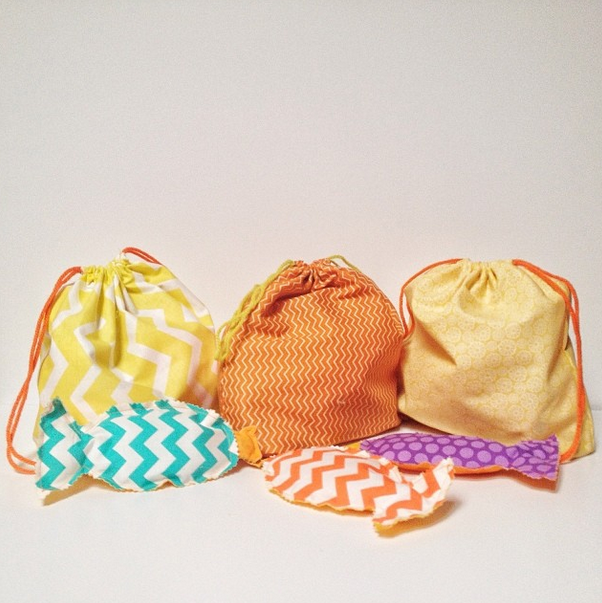 You'll also need a 1/2 yard of something fun for the drawstring bag. Stuffing. The fish are only minimally stuffed. I used polyfill I had laying around, but you could also use paper, fabric scraps, plastic bags, etc. Magnets. I used 1/2-inch round magnets bought at JoAnn's Craft Store. They come in packs of 50. You'll need one for each fish and one for the end of the fishing pole. 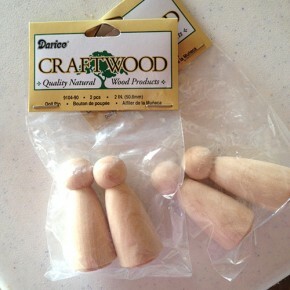 Wooden doll pin. This is the cute little bobber that hangs at the bottom of the fishing line (painted red in the photo above). I found this in the aisle right along the dowels. Who doesn't want a bobber that resembles a tiny wooden doll? Wooden ball caps (x2). Not sure what these are called, but these are the round balls you see on the ends of the fishing pole. I bought two for each pole (one on each end). 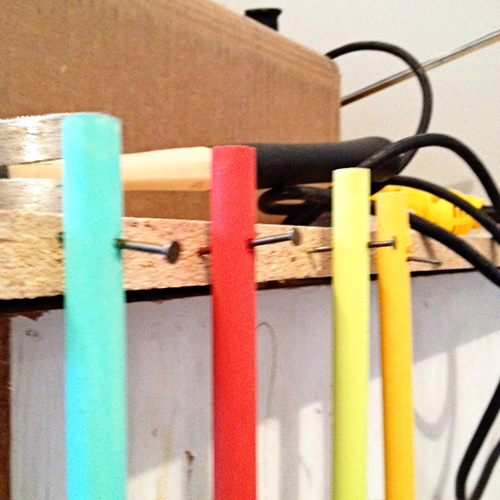 They come with a 1/2-inch hole already drilled in them so it's easy to just glue them onto the ends of the dowel. 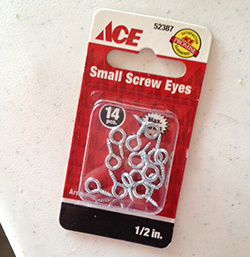 Eye hooks (aka: Screw Eyes). 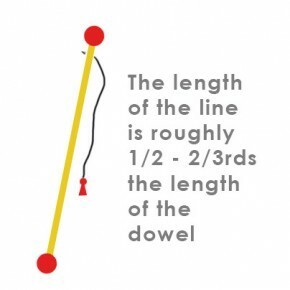 This is what allows you to connect the doll pin to the end of the fishing line. I bought tiny ones with 1/2-inch long screws. Crazy glue (or other adhesive). You'll need to glue the magnet to the bottom of the doll pin, as well as glue the wooden ball caps to the ends of the fishing pole. 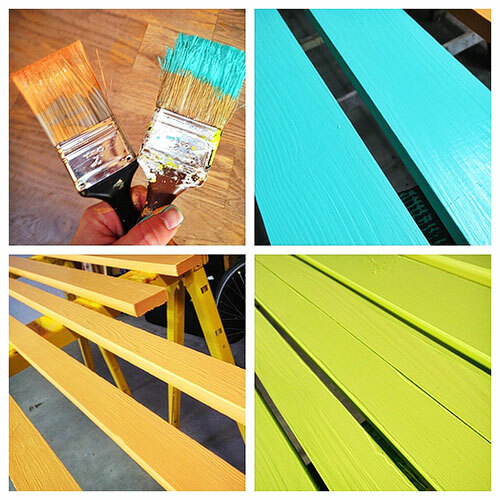 Paint & paint brush. I used regular latex wall-paint that I had around the house from other projects. If you're out of paint, sample pots from places like Home Depot are an inexpensive way to build up a colorful collection. Drill (optional). I drilled through my fishing pole to attach the yarn. Alternatively you could wrap the yard around it (and glue in place for stability) or screw in one of the eye hooks and attach the yarn that way. Pin and sew all the mouth pieces. Starting at the bottom corner, work your way around to the other bottom corner. Leave the bottom open. 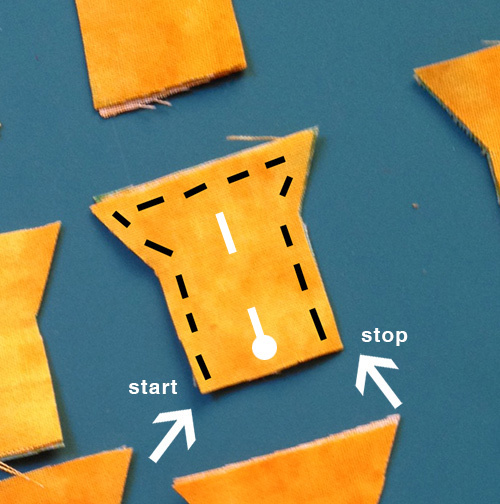 Use 1/4" (or less if you can pull it off) seam allowance. If you err on the side of a bigger seam allowance, you won't be able to insert the magnet later, so definitely stick to 1/4" or smaller. Insert the magnets into the fish mouths. If you stuck to a 1/4" seam allowance or smaller, the magnets should all fit pretty well. If you goofed on some, cut more pieces and try again. Prepare the fish. Pin wrong sides together so that the fish appears right sides out (I top stitched everything so as not to have to mess with turning and hand-finishing the edges, so no need to pin inside out). 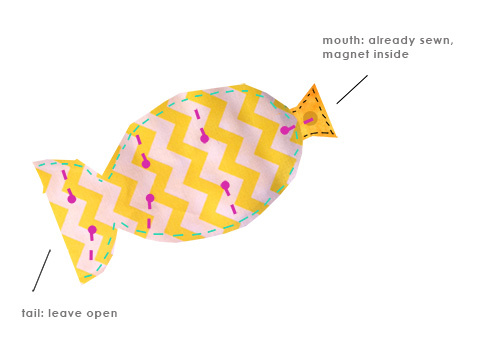 Insert and pin the mouth in place by slipping it between the front and back side of the fish fabric. Stuff and close the fish. Insert the stuffing via the open end of the fish tail and work it around so the fish has some body, but is not "full." When finished, take the fish back to the sewing machine and top stitch the tail closed with the same 1/4" seam allowance. Finishing touches. Snip any hanging threads and if desired, use pinking shears to trim the edges and avoid fraying. Drill a hole through the center of the dowel, 1" from the end. Make sure to use a drill bit that will make a hole large enough to accommodate whatever you plan to use for the fishing line. To steady the dowel, I used a clamp to attach it securely to the counter top, leaving just the edge of the pole extended past the counter for drilling. It was simple enough I'm guessing you could just hand hold it against a steady surface. 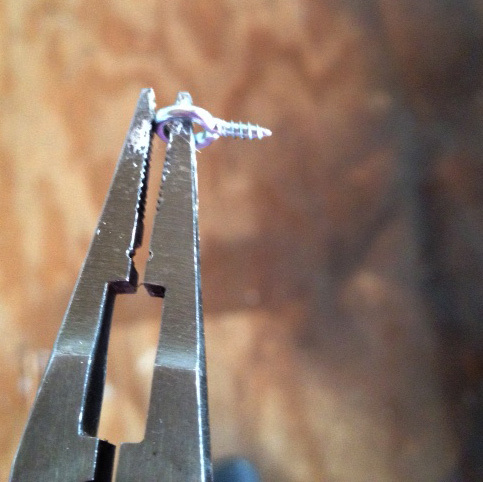 Insert the eye screw into the top of the doll pin (no drill required). I found it easiest to grasp the eye pin with the end of needle nose pliers in my non-dominant hand, then use my other hand to firmly press/screw in the doll pin. 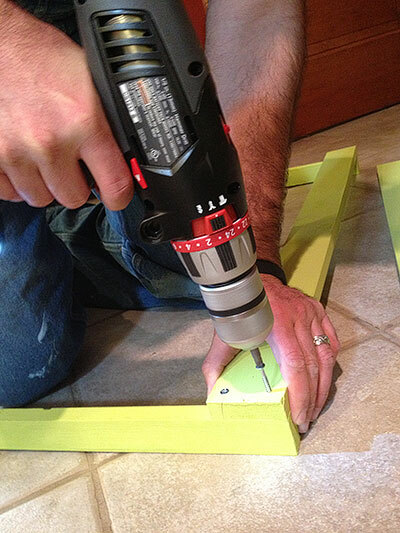 It takes some elbow grease, but you definitely don't need a drill. Paint! Paint the dowel, the doll pin, and the wooden ball caps. Experiment with color pairing to find what you like best. (I painted the ball caps and the doll pin one color, and painted a contrasting color for the fishing pole itself.) 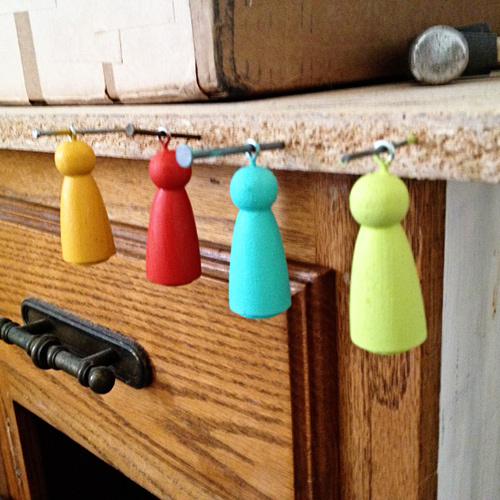 When finished, I hung everything to dry by tack nailing them to the edge of the work bench counter top. Let dry for several hours (or even overnight). Get your glue on. Glue the wooden ball caps to the ends of the fishing pole and the magnet to the end of the doll pin. Be sure to use a strong, permanent adhesive. 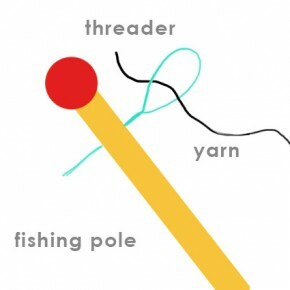 Thread and attach the doll pin (aka: the bobber). Tie the other end of the yarn to the doll pin. The longer you leave the fishing line, the more challenging it will be for users. If you're making this for little kids, shorter is better. I ended up having the bottom of the bobber (the doll pin) land slightly below the half-way point on the dowel. A simple double knot will do. 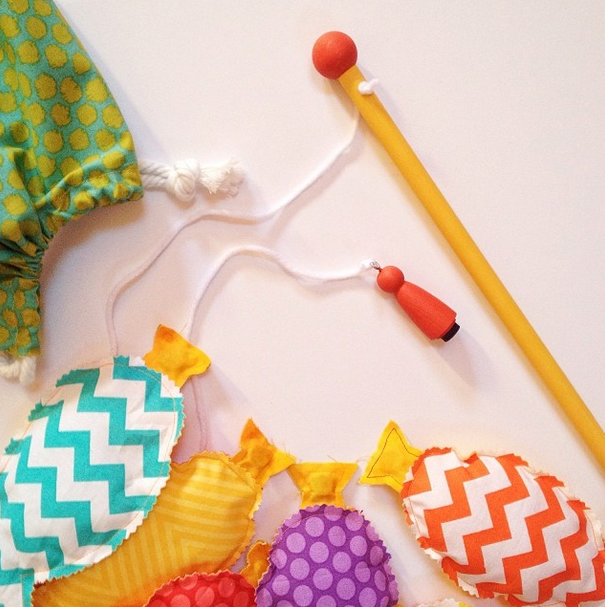 I followed along with this quick and easy drawstring bag tutorial. I made the middle sized bag, using a 12x24" rectangle. When it came time to make the gussets, I opted for only 1.25". Originally, I bought cording to use for the drawstring instead of yarn, but forgot that it gets doubled around the bag, and didn't have enough room in the channel for it. Live and learn, right? 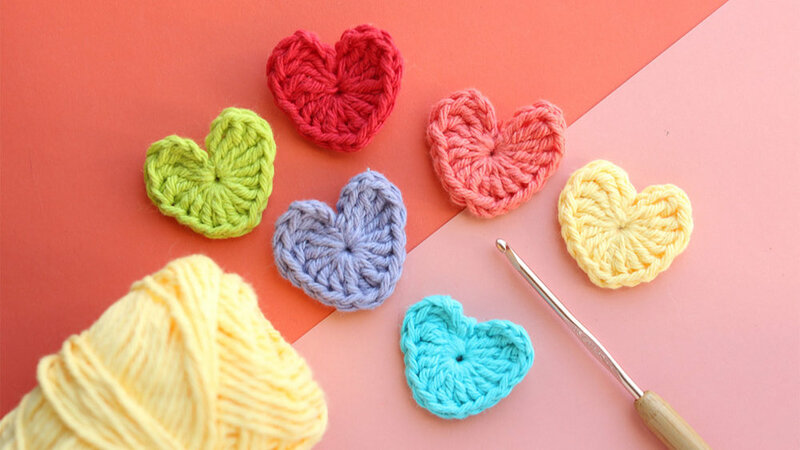 I'd love to see anything you make using this tutorial! Please share the love! :) Happy fishing! The only part of the process that I've been less than 100% satisfied with is collecting the Instagrammed images. Up until now, I've been downloading my entire archive (from InstaArchive), then separating the photos that I've added since making my last book so I can include the newer ones in the new book. Not a huge pain, but not as convenient as it seems like it should be. Now, every time I'm ready to make a new book (I do so about every 250 images), I don't have to sift through my whole archive to find the new stuff. I just download them from my DropBox! When I'm done, I empty the DropBox folder, and I'm all set to start shoot for my next book! For the step-by-step on the whole process, check out my earlier post. *** This post has been updated to make it even more awesome! *** Let's be real. I appreciate scrap booked labors of love as much as the next gal, but honestly, if my future (yet-to-be-conceived) children are to have any chance of having their memories live on in an analog format, I can't carry on with the fantasy that someday I'll make scrap booking a regular part of my life. Maybe for a special gift, but definitely not a monthly/yearly thing. Thankfully, I found a painless alternative. I've been stewing about how I can make it easy to make sure that our family memories (and bits of daily life) have a life beyond a dusty ol' pile of hard drives. I generally recommend that each time you download photos (whether from your phone, or your "real camera"), pick your 10-20 favorites and order some prints. When they come, just drop them in a photo storage box. Getting fancy with glue and scissors is nice, but totally not required. Of course, if you're like me, as diligent as I am with taking care of client images, when it comes to my own personal photos—I'm lucky if I download them 3 or 4 times per year. In fact, I've gotten to the point where—like lots of folks—most of the time, the only camera I have with me is my phone. And the most action my personal photos ever see is if they happen to get posted online via Instagram, etc. 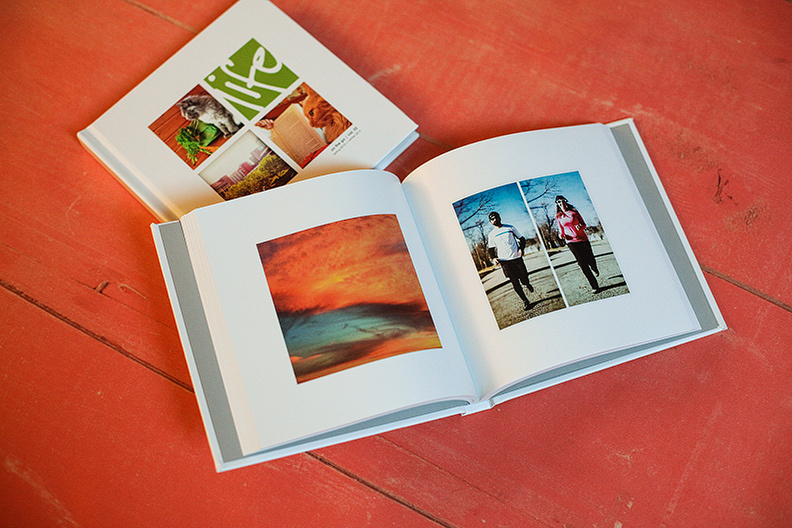 So it made the most sense to find a way to make a book from my Instagram images. And since sifting through my entire photo collection in search of the images I happened to post to Instagram is not likely to happen (like trying to find a needle in a haystack), I was on a mission to find a better way. Enter Blurb. 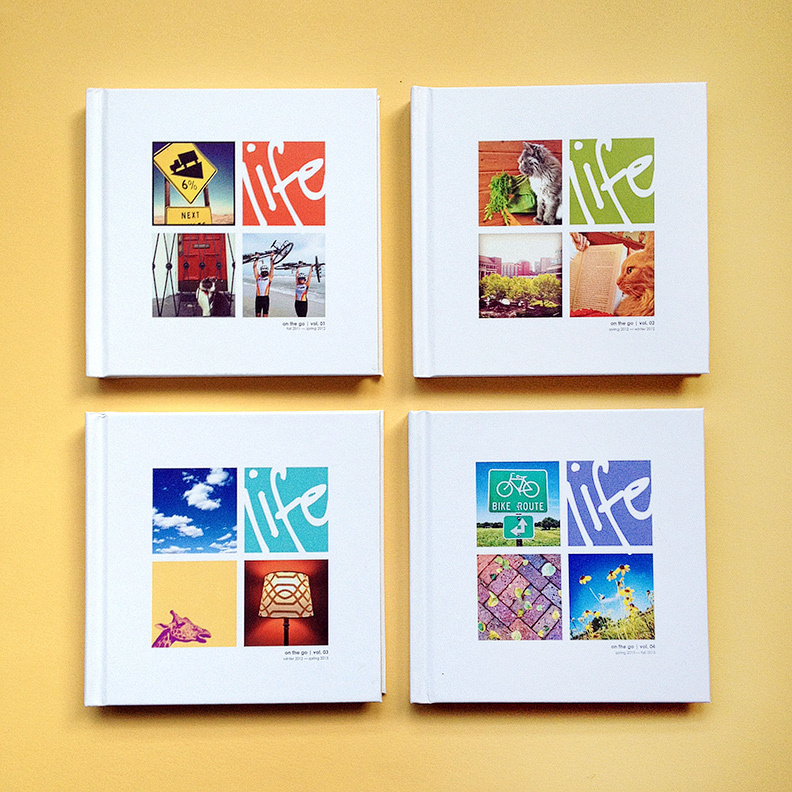 There are a lot of book-making solutions out there (especially when it comes to Instagram and other social photo sharing sites), but many leave much to be desired in terms of design flexibility, ease of use, and product quality. Blurb also makes a book plug-in for Lightroom, but after playing around with it for awhile, though the interior page layout options had what I wanted (a single square image per page), I found the cover layout and material options to be limiting (compared to the choices Blurb offers elsewhere) and ultimately I wasn't able to cobble together the book in the specific way I wanted. So, I turned my attention back to Blurb's free desktop application (called BookSmart). Download your photos from Instagram. You can use something like InstaArchive to download a .zip file of your entire collection. 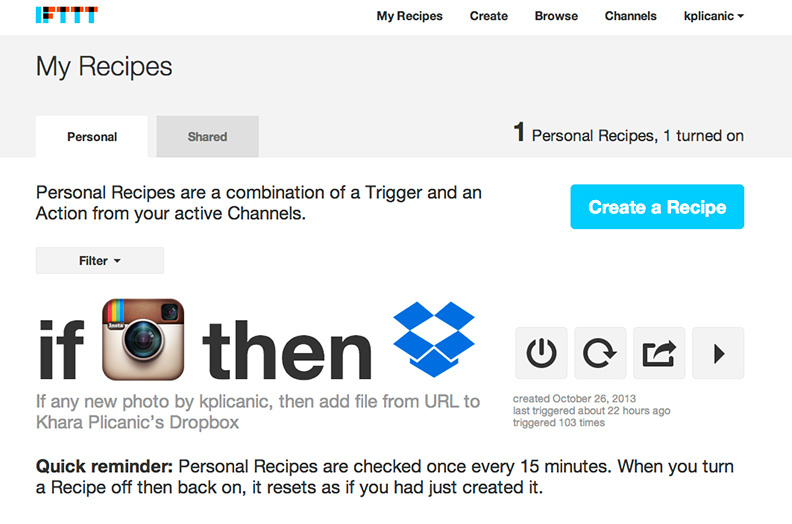 After you make your first book, I suggest creating a recipe with IfThisThenThat (IFTTT.com) so you can have your instagrammed images sent to your DropBox Account where they'll already be waiting for you in a nice organized folder (this is my favorite method). Unfortunately, they'll only be sized to 612px x 612px. Don't panic. We'll deal with this in step 3. Sort and renumber the files. Use Bridge or Lightroom (or whatever works) to renumber the images. They should already appear within Bridge in chronological order, but if with long goofy file names, there can sometimes be problems with file order, so I always make sure to renumber. Batch upsize them. Bummer that the archived or DropBoxed images from Instagram are so low res. (it will be ok, breathe!) Use a quality plug-in to scale them up without tearing a hole in the universe. I use Alien Skin's Lightroom plug-in called Blow-Up (they have a free trial as well as a verion of the plug-in for Photoshop). 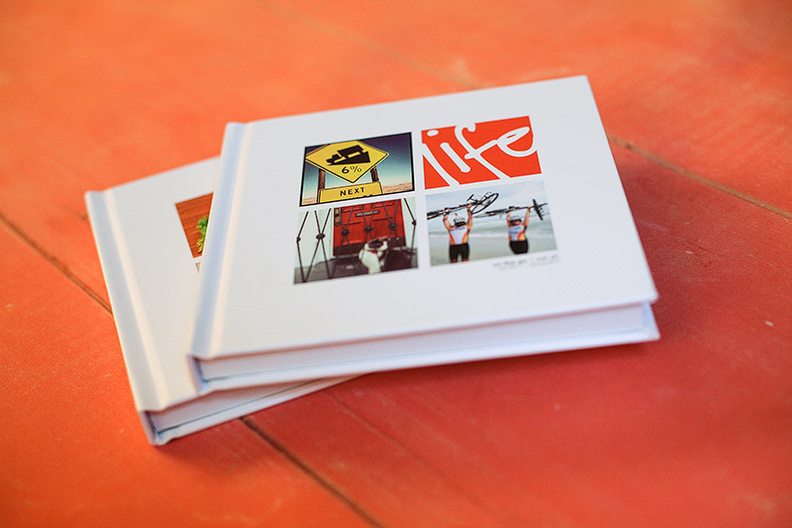 I size my images big enough to print 4x4 @300ppi (1200 x 1200 pixels). Decide on a page layout. Choose one of the existing layouts in Blurb's desktop application and drop in your images. Or, for more control—build your own layout. I wanted a single image per page with plenty of white space around it, so I wrote a Photoshop action to build out each 4x4 image with a nice white background to fill out a 7x7 page. You can write your own, or download my custom action here (for a 7x7 book). Then batch run the action on the whole folder via Bridge. Design a cover. You could use InDesign (recommended), Photoshop, or do it directly in BookSmart (Blurb's free desktop application). I'm a control freak who wants a consistent cover design for all my books, so I designed accordingly (using InDesign) and will swap the images (and colors) with each "edition." I also included a place for volume/date information to note the time span for each book. For example, Vol. One reflects the fall of 2011 through the spring of 2012. Additionally, I included a photo of both Emir and I on the back to quickly document how we change over time. In the future, that image be a whole family photo. If you have InDesign CS4 or newer, you can download my front/back cover InDesign templates here. Drop in your own photos, edit the text, and export to jpg. This year, I decided to get crafty for the nephew's Christmas presents. 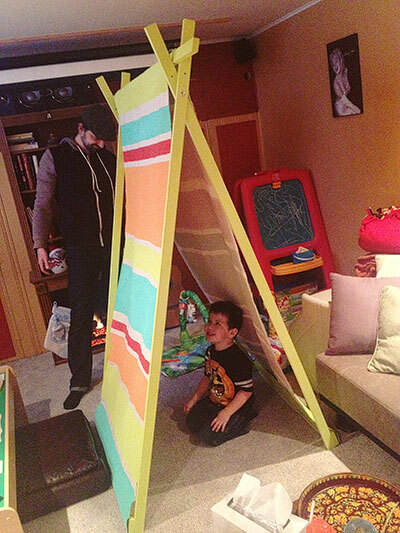 5 nephews in 3 families meant making whatever I came up with in triplicate to avoid any melt downs... Thankfully, these A-frame tents (via Ana White) were simple enough that making three of them was pretty painless. 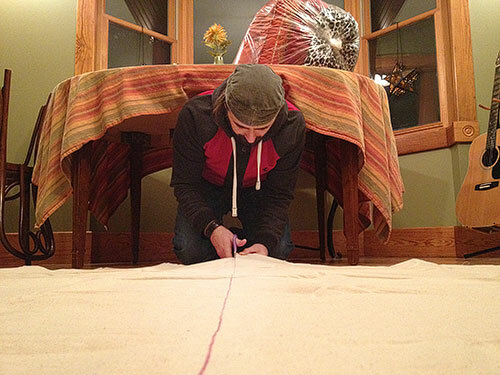 I pretty much followed Ana's plan, but instead of curtain panels, I bought a 9'x12' canvas drop cloth from Lowe's (available in the paint section, the kind you put on the floor to keep it free from spills and drips) and cut it into thirds measuring 3'x12'. It turned out that the drop cloth wasn't exactly 9'x12'... the edges weren't straight, so I had some trimming and clean up work to do, but over all, it was like $10 for the material, which was definitely cheaper than 6 curtain panels or fabric by the yard. 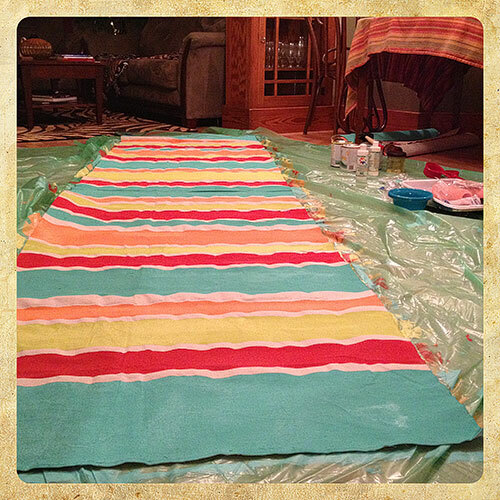 To get the fun and playful stripes, I mixed regular interior latex paint (Valspar, also from Lowe's in Orange Crush, Twist of Lime, Dive In, and Cherry on Top) 2 to 1 with a textile medium from the craft store. This thinned it out, making it appropriate for fabrics and keeping the canvas from becoming crusty and stiff once painted. Although I painted the stripes on the canvas roughly the same for each tent, I decided to paint the wooden frame for each tent a different color. One green, one blue, and one orange. 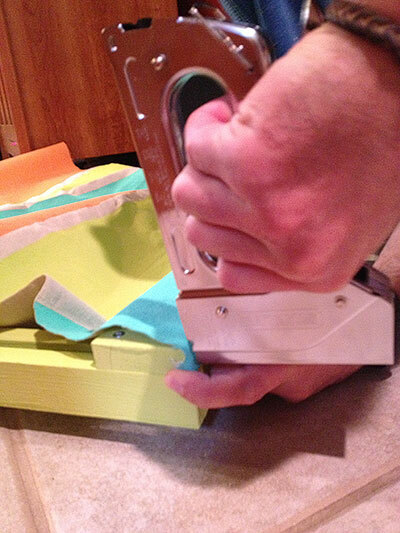 Then, Emir screwed the frame together and staple gunned the fabric on. 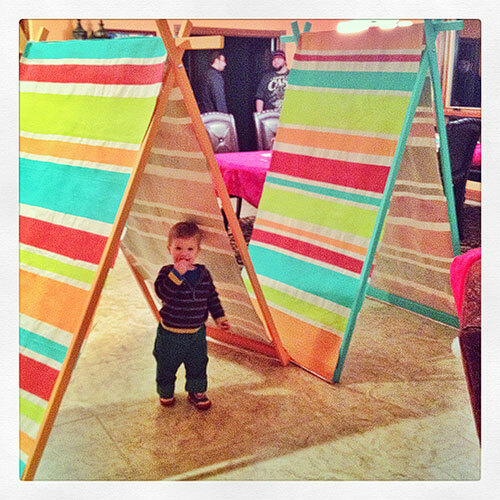 We delivered Haris and Eldin's tent, then unveiled Cole's, Dominic and Oscar's on Christmas Eve at the lake. How to Make a Domino Bracelet With Your Photos! 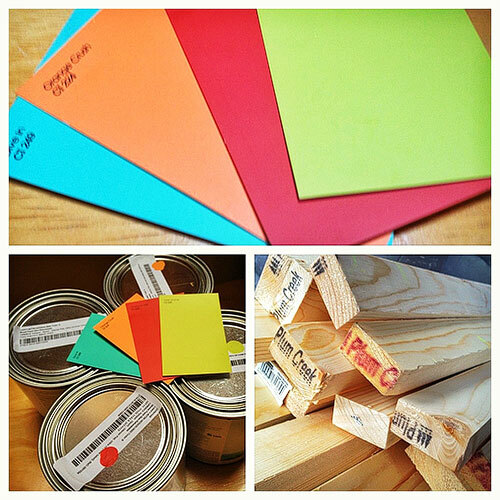 Who doesn't love a good photo related craft now and then? Whether you're in the market for some crafty fun or you just need a fun, last-minute gift idea... this is for you! 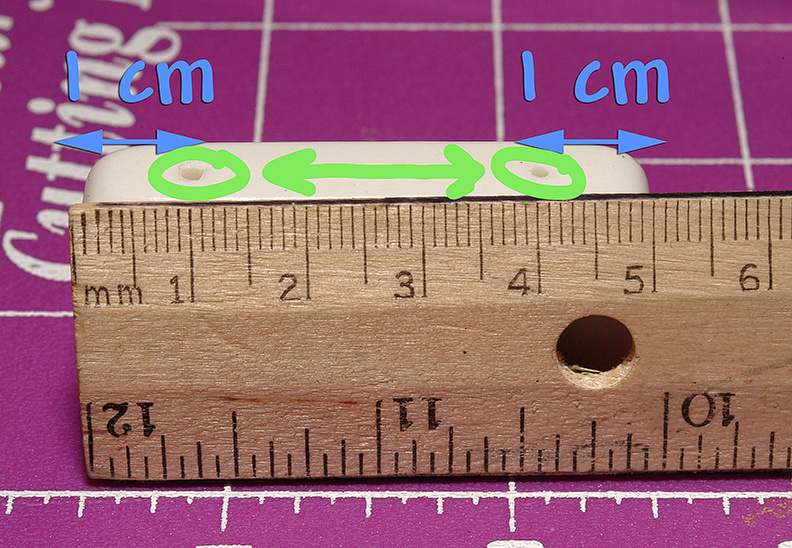 STEP 1: Drill holes Measure 1cm in from each end of the domino and mark for drilling (2 holes for each domino). Drill through each domino. (A vise is very helpful, but not necessary.) If you prefer, it's easy to find pre-drilled dominoes at most craft stores if you don't have a drill or want to save a step. STEP 2: Prepare and print photos Dominoes measure 1” wide and 2” tall, so as long as you make the photo a smidge (a very technical term) smaller than that, you should be golden. To make things easier for you, take advantage of this lovely Photoshop template. 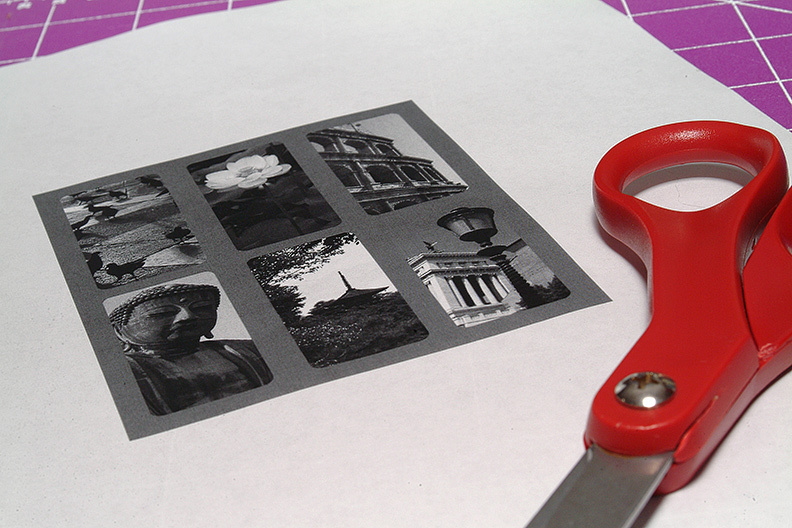 STEP 3: Adhere photos to Dominoes After printing the pictures and cutting them out, you’re ready to glue! 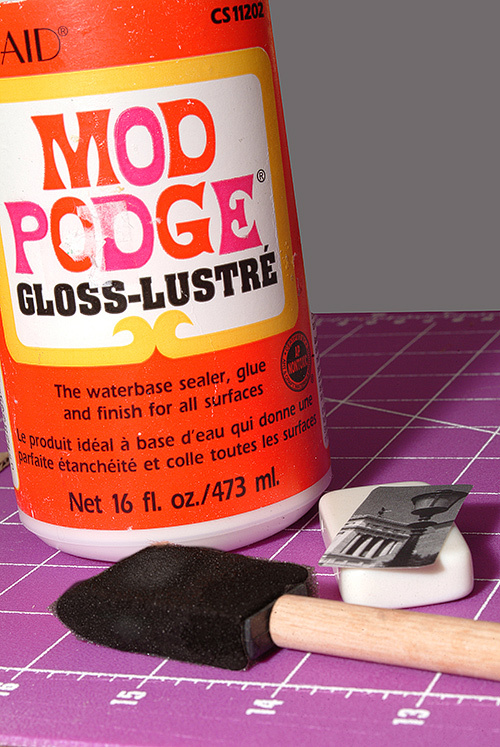 Cover the back of the photo with glue (Mod Podge) and place it on the smooth side of the domino. (If you haven’t figured it out yet, the dotted sides are the inside of the bracelet. It’s actually reversible. If you want to wear it inside out, you can!) Repeat for the remaining dominoes and let dry. STEP 4: Protect your photos! 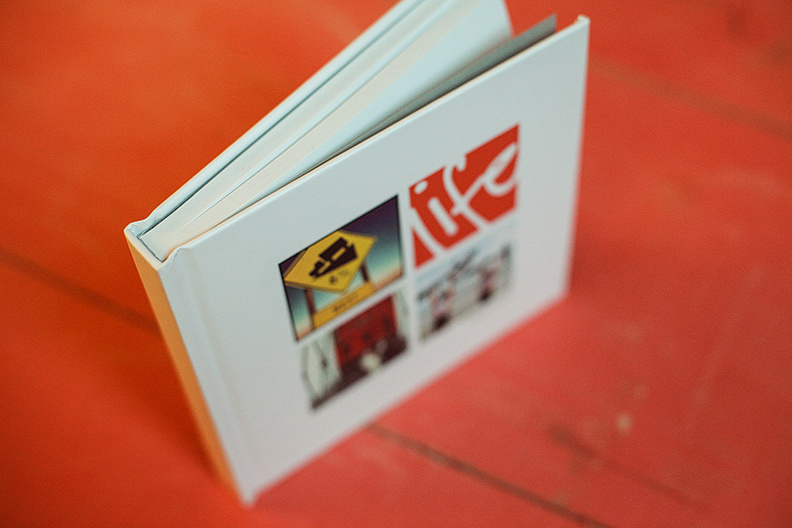 Cover the front of each photo with a couple coats of glue to seal and protect it. (Allow to dry between coats.) Don’t panic, it will dry clear. STEP 5: String together Layout the dominoes in the desired order. Begin threading the elastic through the top holes in the dominoes, adding a spacer bead between them. Cut the cord and begin again on the bottom holes. To finish, tie the ends of the string together making a knot (one for he top row, one for the bottom row). Viola! Get ready to turn some heads!